Nokia is undoubtedly one of the highly anticipated smartphone manufacturers to make its comeback in the smartphone space. Recently, two Nokia-branded Android devices – Nokia 5320 and Nokia 1490 – were spotted on GeekBench. These smartphones had a rather outdated specification, as the devices were running on Android 4.2 Jellybean and 4.4 KitKat. Earlier in August, Mike Wang, Nokia’s president of the joint management team in China, said that that Nokia will announce at least three Android devices later this year. Now, a mysterious Nokia-branded smartphone — Nokia D1C — has once again popped up on Geekbench listing. This time around, the specifications and features look on par with the current offering and the smartphone might finally see a light of the day. 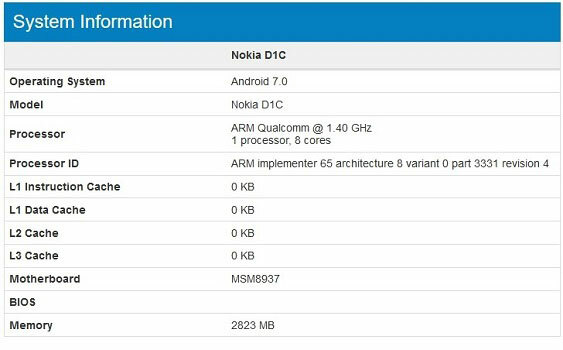 The benchmark website has posted multiple test results on Nokia D1C. The phone scored a highest of 682 in single-core test and 3299 in multi-core. The Benchmark listing also reveals smartphone is powered by Qualcomm’s 64-bit Snapdragon 430 octa-core processor (MSM8937) clocked at 1.4GHz paired with Adreno 505 GPU. The Nokia D1C android smartphone carries a 3GB RAM. On the software front, it was spotted running on Android 7.0 Nougat. The listing doesn’t reveal any information about the display size and resolution and camera setup. Nokia’s phone business got acquired by Microsoft in the year 2014. And as per the agreement, Nokia couldn’t add their branding to a smartphone until the last quarter of 2016, and now, the company has reportedly confirmed that it will be making a comeback by launching Android-powered smartphones and tablets in the fourth quarter of 2016. The upcoming Nokia handsets will be manufactured by HMD Global.